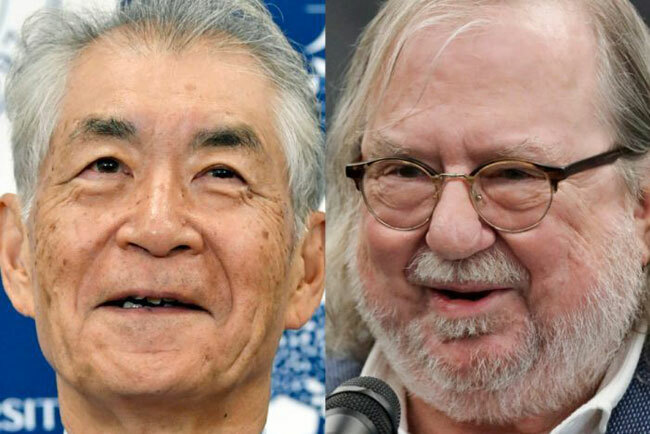 Two researchers from the US and Japan have won the Nobel Prize in medicine for discoveries that have revolutionised cancer care, turning the body’s immune system loose to fight tumours in an approach credited with saving an untold number of lives. James Allison, of the University of Texas MD Anderson Cancer Centre, and Kyoto University’s Tasuku Honjo learned how cancer can put the brakes on the immune system — and how to release those brakes. Their work, conducted separately during the 1990s, led to the development of drugs known as “checkpoint inhibitors”, first used to treat the deadly skin cancer melanoma but now used for a growing list of advanced-stage tumours, including those of the lungs, head and neck, bladder, kidney, colon and liver. The drugs marked an entirely new way to treat tumours, a kind of immunotherapy that uses the patient’s own body to kill cancer cells. Up until then, the standard arsenal consisted of surgery to remove the tumour and radiation and chemotherapy to poison the cancer. The research was “a landmark in our fight against cancer”, the Nobel Assembly of Sweden’s Karolinska Institute said in announcing the award. The two scientists will share the $1.39 million prize. “Not all patients respond to this, but for the ones that do, it has made a huge difference to their lives,” said Arlene Sharpe, co-chair of microbiology and immunobiology at Harvard Medical School. Jedd Wolchok, chief of the melanoma and immunotherapeutics service at Memorial Sloan Kettering Cancer Centre in New York, said “the science they pioneered” had saved “an untold number of lives”. Indeed, a drug based on Professor Honjo’s research was used to treat former US president Jimmy Carter, who was diagnosed in 2015 with melanoma that had spread to his brain. A year later, he announced he no longer needed treatment. Professor Allison, 70, who was in a New York hotel for a scientific meeting, said at a news conference that the Nobel committee evidently had trouble reaching him to break the news — but his phone lit up with a call from his son at 5:30am when the names of the winners were released. And soon, “there were people beating on my door at six in the morning with Champagne,” he said. At a news conference in Kyoto, Professor Honjo, 76, told how a member of his golf club once walked up to thank him for the discovery that was used to treat his lung cancer. “He told me, ‘thanks to you I can play golf again’,” he said. Scientists had been trying for a century to harness the immune system against cancer, but it was a struggle. Normally, key immune system soldiers called T cells seek out and attack invaders. But for poorly understood reasons, it was hard to rev them up against cancer. Professor Allison said he wasn’t trying to cure cancer, but to understand how T cells worked when, at the University of California, he was studying a protein named CTLA-4. He learned that the protein could put the brakes on T cells, creating what’s called an immune “checkpoint”. Working separately, Professor Honjo discovered another protein, called PD-1, that also hampered T cells’ ability to attack cancer, but in a somewhat different way. Professor Allison’s research led to development of the drug Yervoy, approved in 2011 after studies showed it extended the survival of some patients with late-stage melanoma. A few years later, developers created drugs called Keytruda and Opdivo that release the PD-1 brake Professor Honjo discovered. Professor Allison said the biggest challenge with immunotherapy now is to learn why it helps some patients but not others — and how to combine it with traditional therapies to improve outcomes and reduce side effects.